Got to love this recipe. It is gluten-free, lighter than average on the cheese and full of flavor. Purchase ground flax or almond meal or grind your own. Just add the flax seeds or almond seeds in a high powered blender or coffee grinder (one not used for coffee). Do not over grind or it will turn to a butter. Hand stir all the ingredients together. Whisk or beat eggs and pour into a shallow dish or bowl. Mix together the meal crumb ingredients and place in another shallow dish or bowl. Dip chicken breasts into beaten egg, covering all sides, then into meal crumb mixture coating all sides. Heat oil in a skillet over medium high heat. Place the coated chicken in skillet and saute for about 8 to 10 minutes on each side. Check to make sure chicken is thoroughly cooked through and juices run clear. Heat up pasta sauce in a pan. 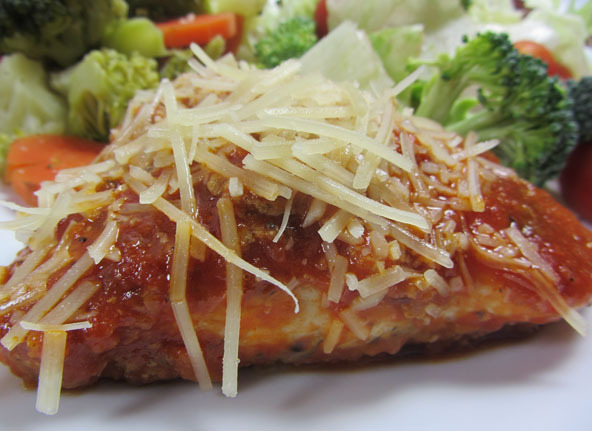 Plate a serving by placing the breaded chicken on the plate, then the hot pasta sauce, and top with a sprinkle of shredded Parmesan cheese.